)'( THE ROAD TO BURNING MAN )'( ---> A series of shows in August dedicated to artists who will be playing at Burning Man this year! 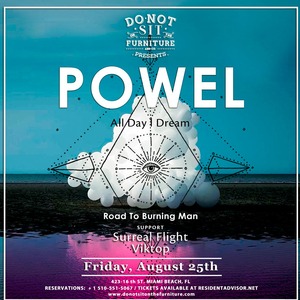 In this series on Saturday, August 25th, we welcome back our good friendॐ ●• ----- Powel -----~•● ॐ(Das Sind Wir/All Day I Dream)https://soundcloud.com/powelSupport by:Surreal FlightViktopPowel's deep and warm sound finds admirers all over the globe, so it didn't take long till masters such as Luis Junior and legend Leftfield requested remixes which gained him quite the attention. With four successful US tours, gigs at major festivals such as Sonar Barcelona and Fusion and international releases, Powel went on building a profile globally. For over a year now, Powel has been closely working together with renowned DJs and producers Matthew Dekay and Lee Burridge and joined the roster of their well-established US-label All Day I Dream.